All products are priced as marked on the website. U.S. Customers only. While supplies last. Non-U.S. customers please call 1-800-820-5405 for information and to order. All sales final. Filmed in 1999, Jimmy Shumate, Melvin Goins, John Hartford, Jeanette Carter, Charlie Louvin, The Osbourne Brothers, and many more telling stories and singing songs about the history of Bluegrass music. A must-have for any Bluegrass fan! 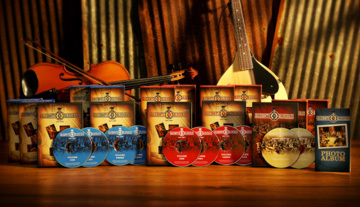 When you order the deluxe edition, you'll also received Country's Family Reunion Gospel, a 4 hour series on 2 DVDs with your favorite country legends sharing their faith and singing their favorite gospel songs.